After a poor start to the season, the weather for the last few evening rides has been excellent, and tonight was no exception. A blisteringly hot day had cooled down a little, and with no wind, riding conditions were perfect. 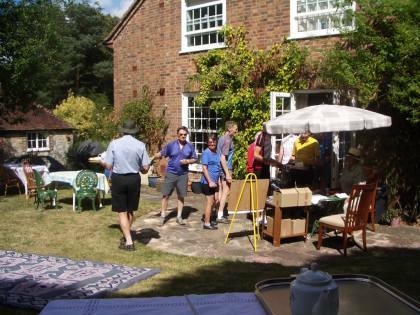 Four of us set out from the Fox - Julian, Val, Alan, and myself - and we threaded our way through the housing estates of Felpham and Middleton, heading to Binsted via Yapton, Ford Lane and Ford. After Ford station we turned into Tortington and began the short, but noticeable, ascent into the foothills of the South Downs, before turning south again for the descent into Binsted Woods. At the very bottom of the hill, the tarmac ends and the lane becomes a rough stony track. Caution is required in order to avoid an unplanned dip into Binsted Lake, presided over by the mysterious shrine to the Madonna. This part of the wood is always a very lonely spot and with the sun slowly setting as we arrived, it did seem to be particularly atmospheric tonight. We did not linger, but climbed up the hill past the ancient ruins of Tortington Manor, to re-join the tarmac, and, eventually, the lane ended up at the pub. No Chichester contingent this week, but we were joined later by Edwin, fresh from his time trialling, who came all the way back with us. For the return route I followed a more direct line over Hedgers Hill and back to Yapton via North End. From Yapton it was straight to Felpham via Middleton Road. Mileage from the Fox, back to the Fox, a modest 18. Sunday 16 July. Chichester start ride to Ayling Garden Centre, Trotton. Another day of cloudless blue skies and temperatures rising to about 28C. I was leading the ride and Avryl and Harvey joined me at the Cross with Adrian meeting us at Compton. 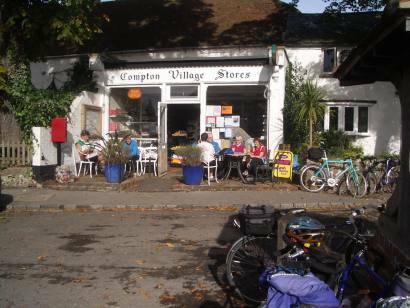 We rode via West Ashling and Funtington to stop for elevenses at Compton Stores. We continued with a fairly easy climb up the southern side of Harting Hill and then a sharp descent to Harting Village. We saw a large group of veteran motorbikes coming towards us. I heard my name shouted and saw Richard Carlisle in the group. 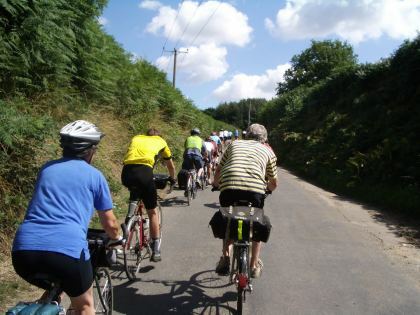 We continued via Nyewood and then a narrow quiet country lane to Trotton. At the Garden Centre John Maxim was waiting for us and we were later joined by Alan and Liz who came direct and then Colin and Gill the Walberton Pond starters. Sam and Graham joined us after riding large parts of Hampshire first. 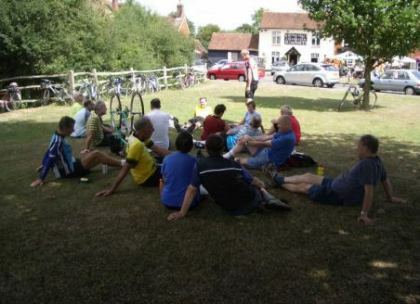 The meeting of Cyclists was completed when Arun Adur members joined us led By Ernie. We headed back on lanes via Didling and Cocking to stop for tea at West Dean Gardens.